Kia ora and haere mai, welcome to the fourth instalment of 9mm for 2018, and the 176th overall edition of our long-running author interview series! I'm aiming to average an interview a week for the rest of the year, but today we're doing a bonus interview (after Clare Carson's 9mm interview yesterday), since Granite Noir is coming up this weekend - a great opportunity to meet lots of cool crime writers from several countries. Along with recent 9mm interviewees Johana Gustawsson and Clare Carson (who'll be appearing onstage together for the "When Bygones Aren't Bygones" panel), today's 9mm target will also be heading up to Aberdeen for the weekend. Today I'm very pleased to welcome the brilliant Stuart Turton to Crime Watch. 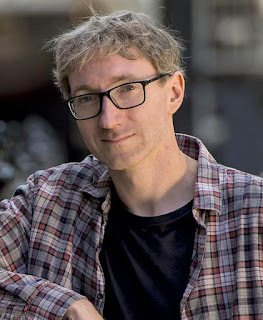 Stu has just released his debut mystery, but already has the crime world abuzz thanks to his intricately plotted, exquisitely written first novel - and the sheer audacity of its high-concept premise. 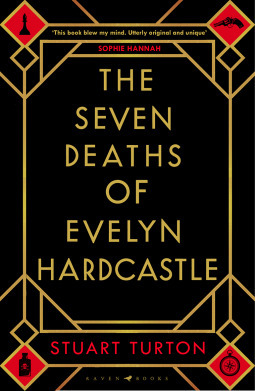 THE SEVEN DEATHS OF EVELYN HARDCASTLE is an Agatha Christie-like country manor murder mystery, but Stu has managed to come up with plots twists that even the Grande Dame didn't think of (a rare feat). 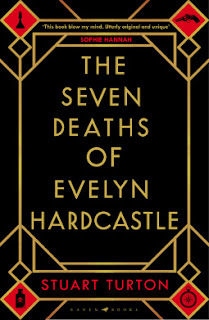 In THE SEVEN DEATHS OF EVELYN HARDCASTLE, the narrator has to try to solve the titular murder, with a few hitches: it doesn't look like a murder, they day of the murder will be repeated over and over until he solves it, and each time he'll wake up in the body of a different guest. He also only has eight 'hosts' - fail and he'll restart the loop, his memories wiped, investigating from scratch. Just how long has this murderous insanity been going on? How many loops has the narrator been stuck in, trying to solve a perhaps unsolvable crime? It's a fiendishly clever conceit that combines Cluedo with Quantum Leap (seasoned by Groundhog Day and Rashomon), but the great brilliance of Stu's debut is that despite all the pre-publication hype about how cool and clever the book is, he not only manages to pull it off, but outdo the hype, delivering a book of the year contender. Stuart Turton will be at Granite Noir this weekend, sharing the stage with Felicia Yap (who also wrote a high-concept crime debut, YESTERDAY) in the "Who Do You Think You Are?" session. But for now, Stuart Turton becomes the 176th victim to stare down the barrel of 9mm. Philip Marlowe every day of the week. I love how sleazy 1940s LA feels in those novels - it's the best, worst, most exciting, dangerous place in history, and Marlowe just wades through it dropping wisecracks, getting punched a lot, and being cleverer than everybody else. They're so good, I feel like authors have been trying to write them ever since. I was eight, on holiday with my parents in Malta. We went into a bookshop and they let me pick any book I wanted. I chose a horror novel called Spectre because it had this weird, horrible, nightmare-inducing cover. 200 pages later, after numerous severed limbs, punctured eyeballs and assorted horrors, I was a shell of the little boy I had been. It was brilliant, and it temporarily made me the most popular kid in school because it went around the playground like contraband. I was a journalist for a decade before being published, so I'd written across newspapers, mags, and websites. I'd written a couple of short stories, which got nominated for things, but Seven Deaths was my first novel. I have a guitar I'm determined to learn how to play before my daughter grows up so she thinks I'm cool. So far I can make it go twang. I don't think that's going to cut it. If visitors are in my hometown it's only because they got off the train to Liverpool two stops too early by mistake, and are waiting for the next one. Widnes isn't a touristy sort of place. There were queues around the block when Argos opened. The bowling alley's pretty good, though. I hate everything I've written ten seconds after I send it to my editor. I wrote a travel piece called "The Brit, the Canadian and the Canoe" a few years ago. It's on my blog. I've very fond memories of the trip that inspired it, so that I guess. Very sadly, I'm not somebody to live in the moment. I've always got one eye on the future, wondering what comes next. When I got my agent, I worried about whether a publisher would buy the book. When Raven Books took it on I worried it wouldn't sell. Now I worry it won't sell enough, and my second book will be rubbish.Eventually I'm hoping I'll find a big enough crack between the things I'm worry about to wedge some joy in, but I haven't found it yet. I've only been a published author for 12 days, so I don't have a lot to draw on. Somebody once asked me which of the vile murderous terrible characters in my book I most resembled. I must have had a mad glint in my eye. Thank you Stu, we appreciate you taking the time to chat to Crime Watch. You can follow Stu on Twitter here.